"The Ladies of the Forum" Dialogue Encounter at the Bedouin village Hura. 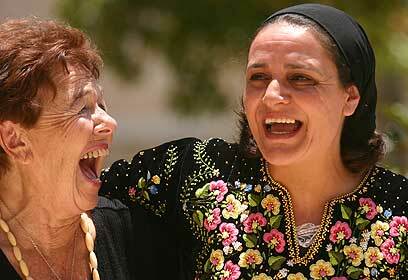 One of our recent endeavors has been to train Palestinian women as discussion leaders in our dialogue encounters. This remains a difficult task as most Palestinian women have an important narrative and message, but speak neither Hebrew nor English. Successful implementation of the project will require good translators, as well as a fair deal of patience and tolerance. Recently, Seham and I met a group of Bedouin women who participate in a social and economic empowerment group. The goal of the gathering and overall project is to support each woman’s entrepreneurial endeavors. Through the project, women participate in weekly meetings, where they listen to lectures on different subjects such as family, politics, and education. We were fortunate enough to be invited to one of these gatherings. For us, it was an opportunity to convey the forum’s message. In addition, the event which was conducted mostly in Arabic allowed us to let PCFF women who do not usually conduct dialogue encounters, participate in a meeting..
Um Ahmad, Seham and Amana greeted me at Kiryat Gat (a town in south Israel) with hugs and kisses after the two "usual" hours of waiting at the checkpoint. We were warmly welcomed at the Community Center Library by a group of twenty women. Most participants were garbed in traditional dress and demonstrated curiosity. Most of them spoke basic Hebrew. A few including the woman who coordinated the meeting and was my loyal translator, spoke in proficient Hebrew. After a brief introduction, personal stories were shared. Amana and Um Ahmad told of their experiences in an Israeli prison, their families, and how they came to the PCFF. During the narration of personal stories and subsequent discussion, many women asked questions. Some inquiries concerned our message, why people don't hear about us more and whether we are trying to influence politicians. In response, all of us, emphasized that all participating women could pass on the things they had learned during the meeting. That like everyone, they too have a responsibility to and influence over the future of the land we all share. After the meeting there was time for personal conversation and heartwarming words of appreciation. Later, the Director of Community Center shared his life story and we all enjoyed a tasty makluba. Left, Zurit. Right, a member of the PCFF, Salwa.